SHIPS FREE! 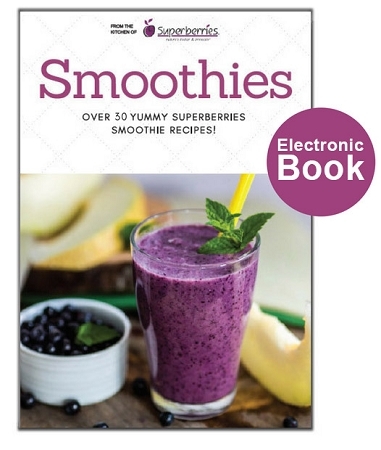 Our Smoothie Recipe E-Book features 32 healthy smoothie recipes that have the option to be made with Superberries Aroniaberry Concentrate or Frozen Aroniaberries. The smoothie recipe book includes citrus & tropical smoothies, garden veggie smoothies; smoothies made from fruits, nuts and melons; and dessert smoothies. Large type and easy to follow instructions make this a must-buy recipe book to go along with your Superberries purchase. The book also includes a guide for selecting the best fruit for your smoothies plus learn why it is so important to Eat Purple! Note: When you order this product you will receive a link from superberries.com at the bottom of your emailed invoice. Click on the link to download your Superberries Smoothie E-Book.